1: WHY ARE YOU WATCHING THIS?! If you have any questions, comments, criticisms, or compliments, just either leave a comment at the end of an article/review or e-mail me at pyltigger@gmail.com. Lastly, if you do have any comments, keep it clean. 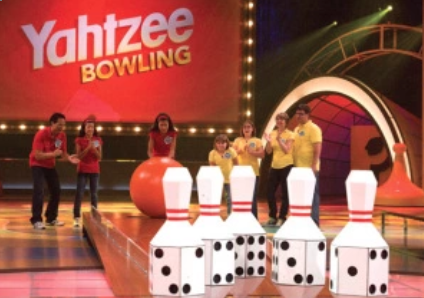 Premise- Two families of four compete in a series of five Hasbro-like board games. For every game a team wins, they win a prize and they get to select a Monopoly Crazy Cash ATM Card. After all five games have been played, each of the ATM cards that have been won by each team is inserted into a Monopoly ATM machine to reveal how much cash was on each ATM card. The team with the most money will win the game and a grand prize vacation package. Both teams get to keep all the money they have won on the cash cards they have collected. This show reminds me of Family Challenge and a better version of Think Fast. There is absolutely NO reason why this show should not last at least two seasons. This show also reminds me of the 1980s/1990s Nickelodeon game shows. If a simple game show like Deal or No Deal lasted more than five seasons, then I see no reason why this show shouldn’t last longer than Deal or No Deal, but I digress. The only concern I have with this show are the group of viewers that may not be able to watch this show. FGN comes on The Hub network, a digital channel that may not be available to everyone in some areas, depending on which cable/satellite package they select. With this in mind, I’m sure that this show will still pull a decent amount of viewers. Todd Newton, like always, does a terrific job by keeping both of the families competing, the viewers in the audience, and the viewers at home entertained throughout the entire 60-minute program. The mini-games that are played throughout the program are nothing short of amazing, challenging, and creative. In general, these games require speed, skill, creativity, strategy, knowledge, and quick-thinking. The five mini-games that were played in the first episode of the series were Scrabble Flash, Bop-It Boptagon, the Cranium Data Head game, Guesstures Freefall, and Operation Relay. After watching the first two games being played, I thought to myself “I hope they don’t use these same five games throughout the entire series.” But then I saw the FGN promo and remembered that they use more Hasbro board games throughout the series (Whew! A sigh of relief). One element of the show that really won me over was the set design. I like the fact that the floor of the set is comprised of the various elements of Hasbro board games appropriately spaced-out, and not all crammed into one area. I also like that the stage is incredibly spacious so that there would be more room to play more challenging, physical, stunt-like mini-games. This is not the type of game show where a small stage is acceptable to run the show properly. On a side note, I do like the use of the classic element of the “chasing lights” throughout the set (I’m a sucker for chasing lights). This is the kind of show I have been waiting for about a decade since the “Millionaire era” came about: a game show that is not entirely based on luck and monumental amounts of cash being given away at one time or none at all. Another factor that I like about this show is the fact that the cash cards that are accumulated by each team throughout the show are not revealed until after the final game has been played, keeping the viewer tuned in for the entire show to find out who the “big winner” is. (I like that kind of ingenuity by the producers). The only problem I have with this show is the failure to display the total winnings in cash and prizes that the winning family has won. I do realize that most of today’s game shows where both cash and prizes are being given away don’t do this, but I think this would be the “icing on the cake” for FGN. But aside from that, I still think that this is a fun, family game show where creativity and knowledge are two of the key factors to victory and where no team goes home with nothing. I hope and pray that we will see more of Family Game Night in the future. 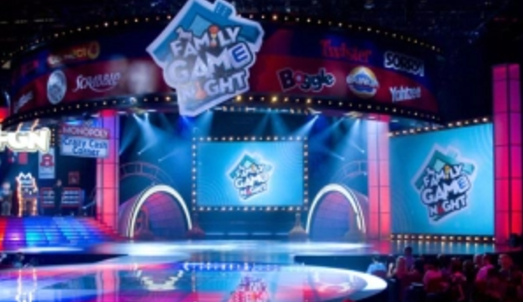 Watch Family Game Night on Friday nights at 7:00 on The Hub network!